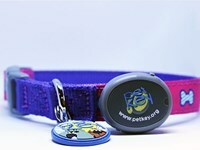 Petkey Glow Collars and Glow Leashes will keep pet's and pet owner's safe while walking at night. 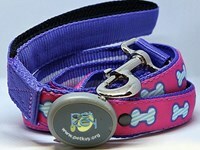 These LED lighted collars and leashes are durable, weather resistent and can be personalized with a petkey ID tag. Fun bone shape design and is made of high-quality nylon sewn around high-efficiency (100,000) hour LED lights. Weather resistant and visible up to 1,000 feet in the dark. 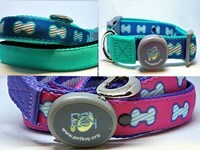 3 Modes including no light, steady light or blinking mode to make your nightly strolls and evening potty breaks safer. Available in X Small (10-14" Girth) and Small (16-19" Girth). Made of high-quality nylon sewn around high-efficiency (100,000) hour LED lights.